The JAK/STAT pathway is a principal signaling mechanism for many cytokines and growth factors and provides a direct mechanism to translate extracellular signals into transcriptional responses. Activation of this pathway stimulates cell proliferation, differentiation, migration, growth, survival, apoptosis, and pathogen resistance. These cellular events are critical to hematopoiesis, immune development, growth, adipogenesis, mammary gland development and lactation, and other processes. Mutations that affect JAK/STAT pathway activity are important in inflammatory disease and hematological malignancies, including erythrocytosis and an array of leukemias. JAK inhibitors are also being tested for use in multiple myeloma. Additionally, the JAK/STAT pathway mediates the effects of drug treatments of anemia, thrombocytopenia, and neutropenia, as well as antiviral and antiproliferative agents. Related antibody arrays - Browse multiplex antibody arrays that detect multiple JAK/STAT pathway proteins. 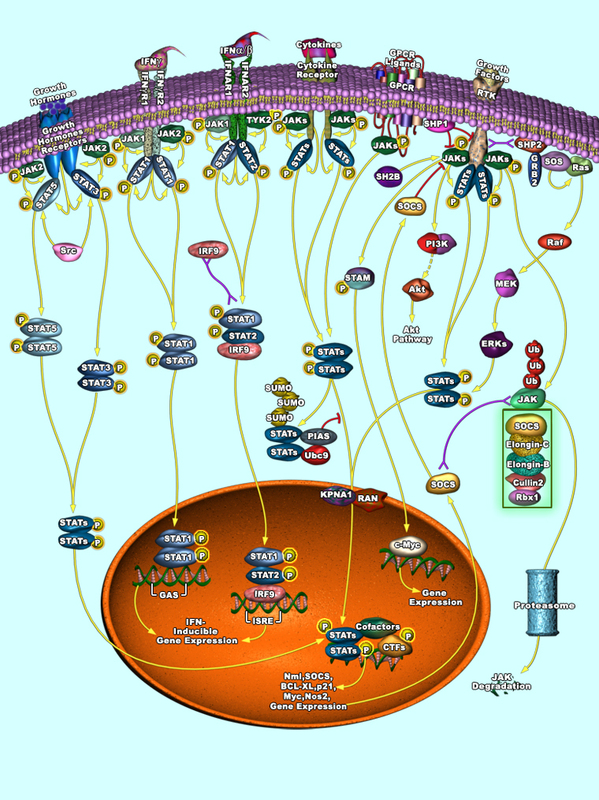 Small Molecules - Browse small molecules related to the JAK/STAT pathway.